The New Year is a time of renewal, of looking to the future while pondering the achievements – and losses – of the past year. With bare trees silhouetted against darkening skies, and dried leaves rustling in the icy wind, Nature seems dormant, like a dying patient. But vital sap still flows, and seeds await their time to germinate. Our winter exhibition, Germination, takes its inspiration from this cycle of growth and decay. It features work by three artists, Tiffany Chung, Sopheap Pich, and Pinaree Sanpitak. Although their artistic practices are quite diverse, they share certain commonalities, balancing a deep grounding in their local context – its history, artistic traditions, and socio-political realities – with a perspective that is informed by active engagement in the global scene. The exhibition opens with Pinaree’s works on paper with dried flowers that are based on a type of Thai floral garland used for ceremonies celebrating both life and death. 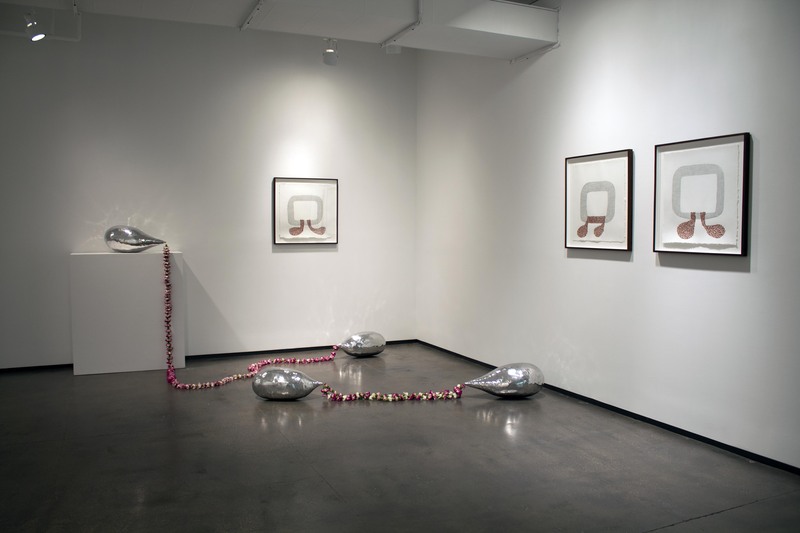 Her breast-shaped aluminum sculptures also incorporate real flower garlands, which will slowly desiccate during the run of the show. 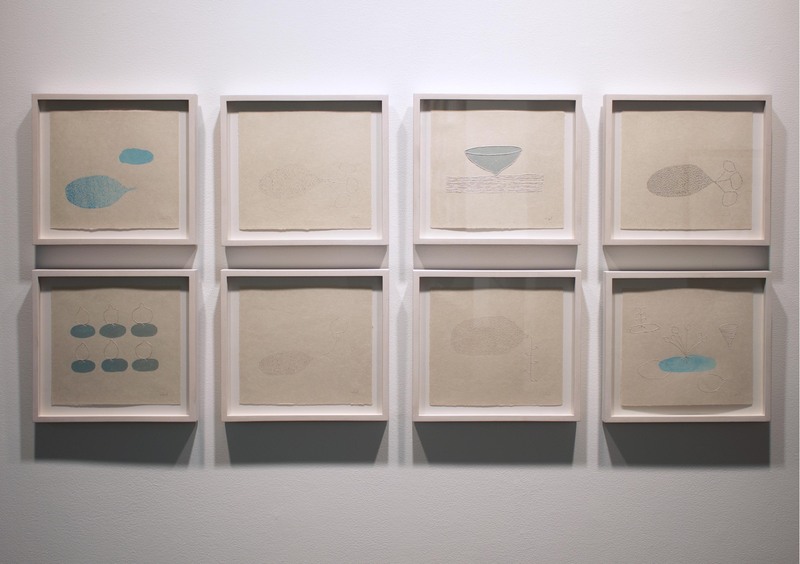 These are complimented by a group of drawings featuring her breast fruit, cloud sprout, and breast cloud motifs, which focus on the female breast as a source of nourishment, at one with the life-giving processes of Nature. 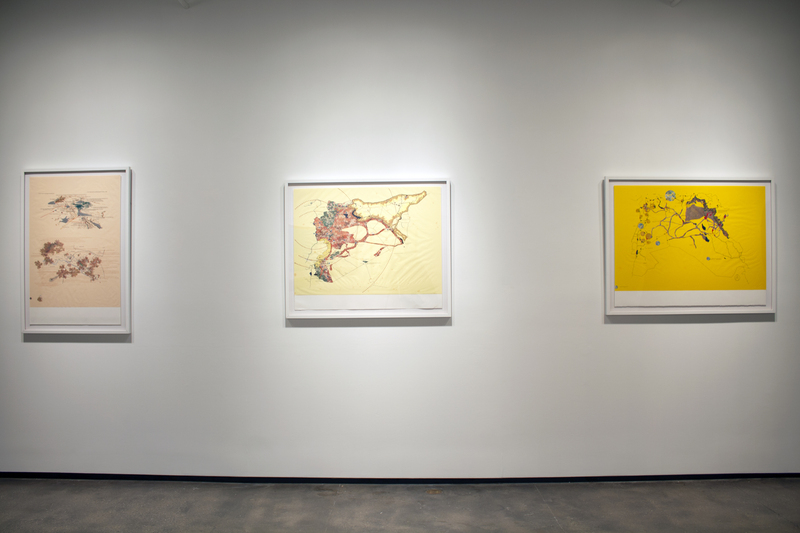 The exhibition continues with Chung’s highly abstract cartographic works on paper in which colorful organic structures seem to grow across the page. But their beautiful surfaces cannot mask the brutal conflicts that the maps chart out. Horrific events, such as the ongoing crisis in Syria, propagate before our eyes. Sopheap Pich’s monumental sculpture, Ordeal, concludes the exhibition, its form based on a dried out seed pod that has released its seeds. 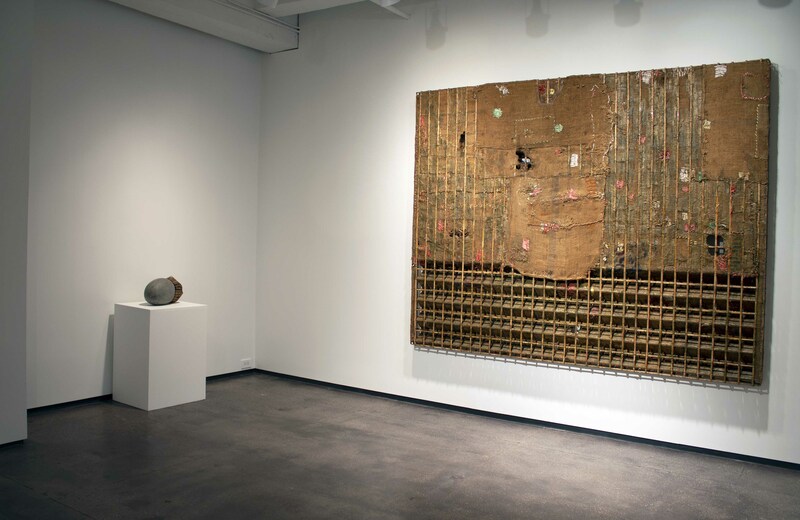 A related seed sculpture rests nearby, along with two Wall Reliefs, grids of rattan and bamboo covered with well-worn pieces of burlap, their roughly repaired surfaces coming together in ordered rows like agricultural fields. Please see below for more detailed information about the artists and works. Pinaree Sanpitak is one of the most compelling and respected Thai artists of her generation, and her work can be counted among the most powerful explorations of women’s experiences in all of Southeast Asia. Her primary inspiration over the past twenty-five years has been the female body, distilled to its most basic forms and imbued with an ethereal spirituality. Her work in a wide variety of media – painting, drawing, sculpture, textiles, ceramics, performance, and culinary arts, to name but a few – is informed by a quiet minimalism that owes something to her training in Japan and sets it apart from the colorful intensity of much Thai art. Often called a feminist or Buddhist artist, she resists such easy categorizations, preferring to let her work speak to each viewer directly, to the heart and soul, with the most basic language of form, color, and texture. Tiffany Chung (Vietnam/USA) is known for her research-based multi-media installations and hand-drawn topographic maps and data visualizations that reference the history of specific places, showing the lingering effects of social disruption, conflict, and environmental change. One of the most respected and internationally active Vietnamese-born artists of her generation, she is currently preparing for an upcoming major solo exhibition at the Smithsonian American Art Museum, Tiffany Chung: Vietnam, Past Is Prologue (March 15 – Sept. 2, 2019), which was organized as a response to the museum’s groundbreaking group show, Artists Respond: American Art and the Vietnam War, 1965–1975, taking place at the same time. Chung’s meticulously detailed works on paper combine precise cartography with abstract motifs that reference microorganisms and molecular structures. Their lush, beautifully colored surfaces, with jewel-like tones rendered in ink and paint stick on translucent vellum, contrast starkly with the somber historical realities they chart out. Her work studies the geographical shifts in countries that were traumatized by war, human destruction, or natural disasters, unveiling the connection between imperialist ideologies and visions of modernity. Her maps, based on rigorous ethnographic research and archival documents, interweave historical and geologic events – and spatial and sociopolitical changes – with future predictions, revealing cartography as a discipline that draws on the realms of perception and fantasy as much as geography. Exploring world geopolitics by integrating international treaties with local histories, her work re-maps memories that were excluded from official records. In recent years, Chung’s interest in imposed political borders and their traumatic impacts on different groups of human populations has underpinned her commitment to conducting an ongoing comparative study of forced migration – through both the current Syrian humanitarian crisis and the post-1975 mass exodus of Vietnamese refugees, of which she herself was a part. Her Syria Project had its debut in the main section of the 2015 Venice Biennale, All the World’s Futures, with an installation of 40 map-based drawings relating to the ongoing strife in Syria. For Germination, we feature three new works from the Syria Project that track recent developments in the conflict and make connections to the ancient history of the region. 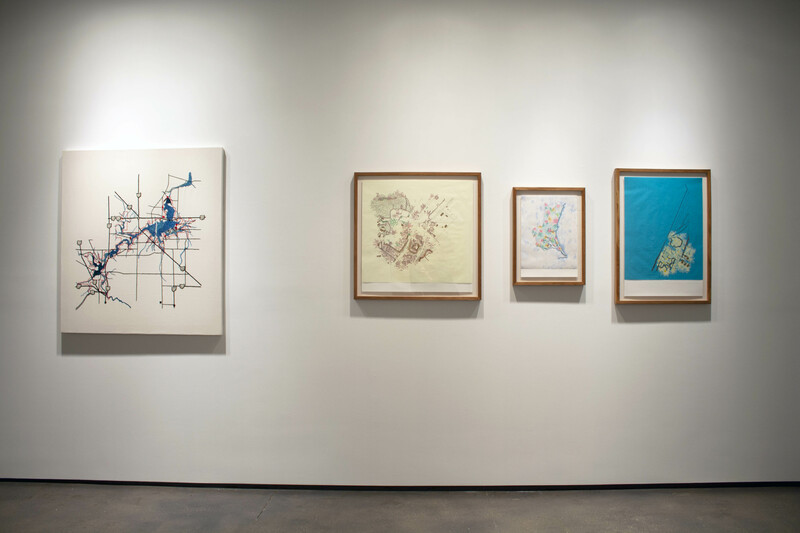 These are shown alongside works from a project she did for an exhibition at the Hitachi City Museum in Japan, which was inspired by World War II era maps of Hitachi showing the effects of militarism and warfare, pinpointing the locations of munitions factories and bombing damage. Sopheap Pich is widely considered to be Cambodia’s most internationally prominent contemporary artist. Born in Battambang, Cambodia, in 1971, he moved with his family to the United States in 1984. After receiving his BFA (University of Massachusetts at Amherst, 1995) and MFA (The School of the Art Institute of Chicago, 1999), he returned to Cambodia in 2002, where he began working with local materials – bamboo, rattan, burlap, beeswax and earth pigments gathered from around Cambodia – to make sculptures inspired by bodily organs, vegetal forms, and abstract geometric structures. Pich’s childhood experiences during the genocidal conditions of late 1970s Cambodia had a lasting impact on his work, informing its themes of time, memory, and the body. His sculptures stand out for their subtlety and power, combining refinement of form with a visceral, emotive force. 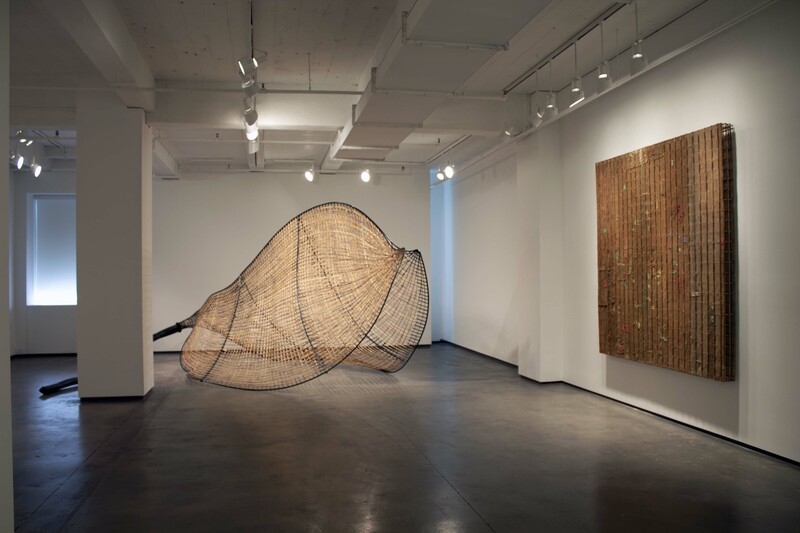 In 2013 he became the first contemporary artist from Southeast Asia to be given a solo exhibition the Metropolitan Museum of Art in New York, Cambodian Rattan: The Sculptures of Sopheap Pich.